Getting your film seen on a big screen seems harder and harder to do, but it's clear that film festivals still play a major role in the preservation of the theatrical experience. The Los Angeles-based Outfest is one of the most prestigious LGBT film festivals in the world, and to celebrate their 32nd year they are trying something new: a series of interviews with the filmmakers talking about their stories and some of the challenges of making them come to life. In the year following spectacular LGBT civil rights advances across the country, the dynamic and fresh slate of 2014 NewFest films decisively demonstrates that artists and storytellers lead the charge in creating social change. Are any of you looking forward to these films? Post your thoughts and comments below. 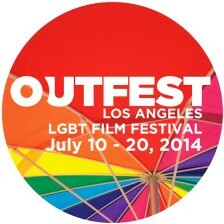 Outfest begins this Thursday, July 10th in Los Angeles.